With 139 miles of trails, the Monmouth County Park System offers many opportunities for enjoyment of the outdoors. 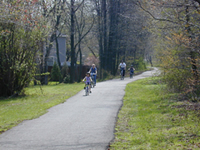 Below is a list of 21 county park areas with trails. Check out our interactive trails map with mobile app. E = Easy Trails (Green Circle). Well-maintained or paved; intended for walking or running. M = Moderate Trails (Blue Square). Longer with some grades/obstructions, intended for hiking, equestrians, and all-terrain bicycles (may be suitable for some walkers and runners). Waterways a bit challenging with obstacles and some portages required. C = Challenging Trails (Black Diamond). Primitive with steep grades or obstructions; intended for hardy, experienced hikers, equestrians and all-terrain cyclists. P = Paved Trails. Designed for specific activities such as roller blading, bicycle riding or whatever activity would benefit from a smooth, hard surface. F = Fitness Trails. Walking/running trail with exercise stations. N = Nature Trails. (Orchid on Green Circle). 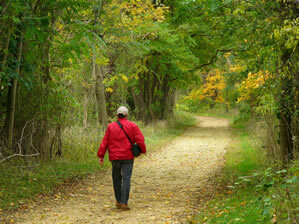 Walking trail to view plants, wildlife and environmental features. Most trails in the Monmouth County Park System are open to walkers, runners, bicyclists, and equestrians. Safe multiple use requires common courtesy and cooperation. 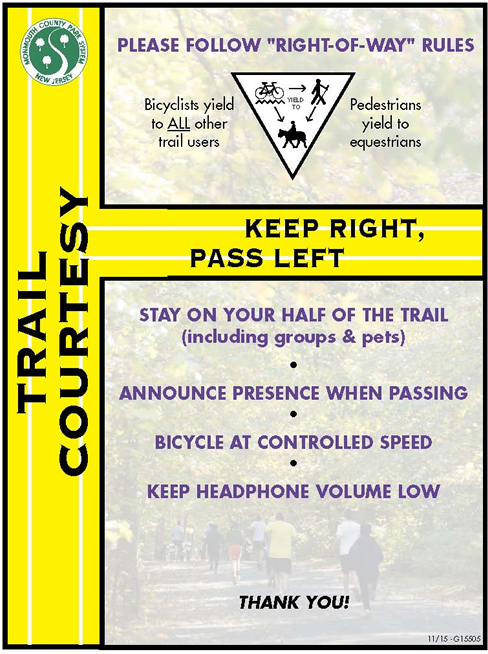 It is important to obey rules of protocol for yielding right-of-way when pedestrians, cyclists, and equestrians meet on the trail: cyclists yield to all other trail users and pedestrians yield to horses. Please stay on the trails - the trails are the safest and best routes through the parks - you may be damaging sensitive natural resources by straying from the trails. Slippery conditions may exist on the trails due to seasonal conditions. Responsible trail use by individuals means an enjoyable experience for everyone. Please preserve the solitude and obey the rules and regulations posted in each park. The Park System recommends that you wear appropriate safety gear for the activity in which you are engaged. According to GoodHiker.com, hiking is a great way to improve cardio-respiratory fitness and lower risk of coronary heart disease and stroke. For children, it improves their cardio-respiratory and muscular fitness, leads to better bone health, and helps in maintaining a healthy weight. Even better, hiking is a great way to reconnect with nature and spend time with friends and family. According to Bicycling.com, cycling makes you fitter, sharpens your thinking, and helps melt away stress. It’s a great family activity, especially when exploring your county parks together.